When it comes to defensive shooting, your shooting stance doesn’t matter. It’s important to understand why that is true. But it also does matter that you do not make your shooting stance matter when you are training and practicing. Confused yet? Let Rob Pincus explain. At the moment you need to defend yourself, you may be standing with your left foot forward, or with your right foot forward. You may be off balance with your body weight toward the back, perhaps even holding onto something. Maybe you’ve been knocked down and need to shoot from kneeling, and with your shoulders either far forward or far back. Perhaps you are even in an ideal shooting stance, with feet shoulder width apart and your body squared off to the target. It doesn’t matter — draw the handgun, drive out, and take the shot. 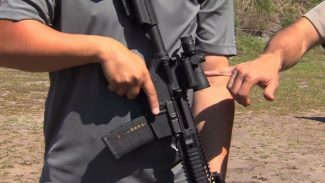 Because of the variables of all the different realistic ways you may need to apply your defensive shooting skills in a self-defense situation, you also need to think about the fact that you need to be practicing in a way that lets you have your feet in a normal range of motion, and that lets you have your shoulders not always aggressively forward nor leaning back. The reality is that your shooting stance doesn’t matter in a fight, but it does matter that you not condition yourself through handgun training and practice to always be standing in a bladed stance with your strong foot back, or always standing with your feet squared to the target, or always standing perfectly upright and squared off, which is a very unrealistic position in terms of your fight athletics but might be the most comfortable way for you to shoot, especially if you’re going to be transitioning from one target to another target. 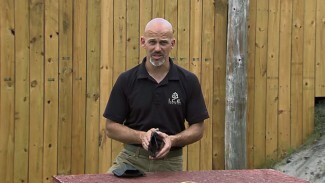 Your shooting stance doesn’t matter when it comes to applying your skills in a defensive context, but it does matter that you vary your stance in your handgun training and practice. 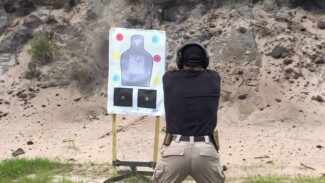 Interesting, when I was shooting for my annual requal, the range officer always referred us back into weaver stance. Glad to see some out of box thinking. One thing USPSA does is get you thinking outside the box and into more realistic environments such as shooting around barricades or going through doors, surprise poppers, etc. During a course of fire it’s uncommon to be able to lock into a certain stance unless you’re just wanting to lose time. Why do they call it practical shooting? Another good video Rob. Still want you to watch that muzzle and your left hand bro. Don’t sweep yourself. Again, the camera angle could be playing tricks. Rob Pincus discusses zeroing your home defense long gun optic and why the normal rules of The Plausibility Principle are trumped by the efficiency of zeroing your rifle for much further distances than you would most likely be using it.